Each new RC Laser is shipped with a piece of paper that lists the 4-digit hull number. The sail number for that boat hull would be the last two digits of the hull number. So, for instance, if your hull number is 3068 then your sail number would be 68. If you are an AMYA member and you don’t know what your boat number is contact the class secretary, Nick Mortgu at mortgu@comcast.net. 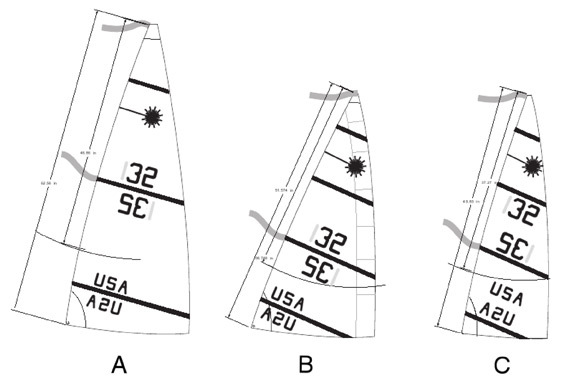 There are several options to put numbers on your sails. You can use a stencil and black markers to color in the numbers on your sails. Be careful near the edges because the black markers occasionally will bleed beyond the stencil. If you would like to order sail numbers and country designations online, you can order from Sail RC, and they will quickly ship them to you. Both numbers will be on one sheet for easy application. They also provide colored hull coverings that meet the class specifications.